Underbite dentition is an abnormal relationship between the dental arches in which the upper jaw is shorter than normal relative to the lower jaw. Veterinary dentists classify this dentition as a Type 3 malocclusion; it is also called mandibular mesiocclusion or maxillary brachygnathism. 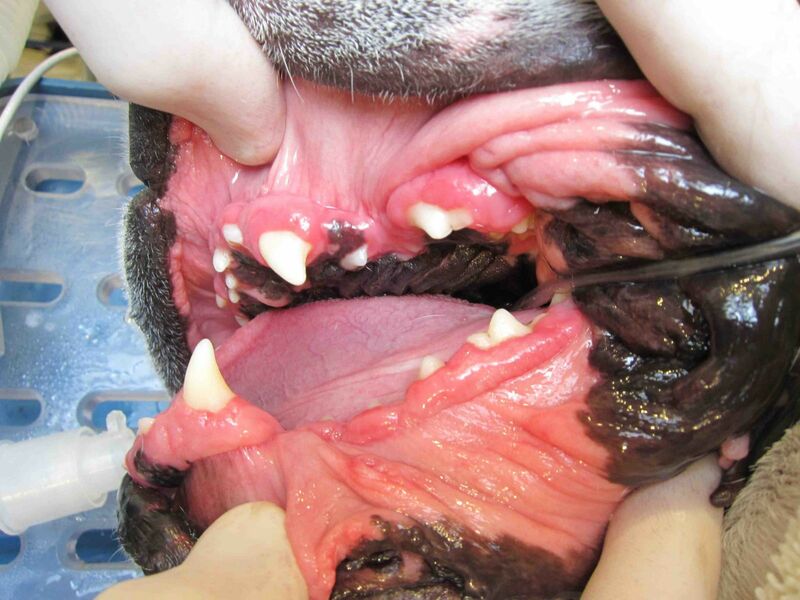 This dentition is considered normal in brachycephalic breeds (i.e. “short skull” breeds) such as the Boxer, Boston terrier, Pug, Brussels Griffon, Bulldog, Shih Tzu, Lhasa Apso, and similar breed types. For most dog breeds, the ideal tooth positions are defined by the occlusal, inter-arch and interdental relationships of the teeth of the archetypal dog (i.e. wolf). The ideal occlusion is described as perfect interdigitation of the upper and lower teeth. Dogs who live with underbite malocclusion are more predisposed to periodontal disease and chronic discomfort compared to “normal bite” dogs. A reversed scissors bite (aka rostral crossbite) is when the upper incisors occlude just behind the lower incisors with the mouth closed; this can result in traumatic tooth-on-tooth wear or damaging contact to the gums, hard palate, or lips. A level bite is when the upper and lower incisors meet edge-on when the mouth is closed; tooth-on-tooth wear attrition and dental inflammation (pulpitis) can result. When warranted, treatment is aimed at limiting secondary trauma and may include orthodontic movement, extractions, root canal treatment, or crown height reduction with vital pulp therapy. Ultimately, our goal is to obtain a functional, pain-free bite for any dog – even if it’s not the “perfect bite” Mother Nature intended.